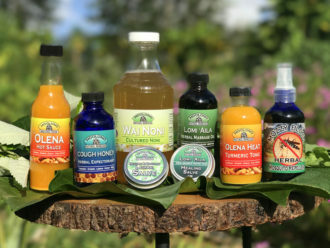 Ho'olono Natural Remedies brings you high quality, potent herbal formulas. Founded in the ancient healing practices of La'au Lapa'au (traditional Hawaiian plant medicine) we offer you natural remedies for today's common maladies. Many of our ingredients are grown by us in our own gardens whose soils are carefully nourished with mulch and compost teas. We also include our ethically wild harvested herbs. The wild areas on this Earth are so valuable to our economy and health, lets save them, keep them clean and keep them wild. We support local farmers with organic practices by purchasing from them. When ingredients and materials are sourced from off of this island, we go through great measures to ensure that they are of highest quality, purity and are either organically grown or ethically wild-crafted. We make our 100% organic and wild-crafted plant remedies in small batches by hand to ensure their quality and potency. We hope that as many people as use our natural remedies are benefited by them and renew their connection to the 'Ania (the land which sustains us). Mahalo!